"Fun cozy mystery that keeps you guessing right until the very end!" 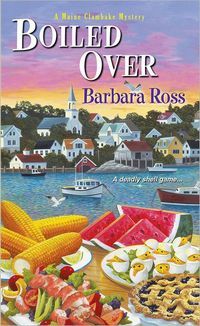 BOILED OVER is Book two in Barbara Ross' Maine Clambake cozy mystery series. The story is set in Busman's Harbor, Maine and Founder's Day activities are foremost on everyone's mind until the murder. Barbara Ross does a great job of showing the small town hierarchy and how that influences everyday life. BOILED OVER is a mystery in which nobody is who they appear to be, and the fun part is tracking down clues to find out who they really are. The murder victim is found in "The Claminator" -- something belonging to Julia Snowden's family. The prime suspect also just happens to work for the Snowdens. Both of these things make for a plausible explanation for why Julia gets involved in the murder investigation. I found the multiple identities used in this book, and the cast of characters to be fascinating. The air of mystery surrounding so many of the characters coupled with the small town setting are evocative of an Agatha Christie-style story. There are so many good suspects that I kept guessing right up until the end. Julia is great as an amateur detective because she's easy to relate to and empathize with. Julia is a little conflicted in BOILED OVER. In a way, it's almost as if her life is on hold while she helps her family financially by working in the family business. There is a temporality to everything -- she's using her mother's home and vehicle rather than put down any roots and get her own, and she refuses to think of anything with her boyfriend in the long term. This window into the main character's inner life adds depth and is an interesting side story in addition to the murder mystery. BOILED OVER is an intriguing and enjoyable cozy mystery with great characters! I hope Julia comes to a clear decision in the next book about what direction to take, with both her livelihood and her romance, in the next book. I look forward to reading the next book in this fun mystery series. For Julia Snowden, the Founder�s Day summer celebration in Busman�s Harbor, Maine, means helping her family�s clambake company to prepare an authentic taste of New England seafood. Any Mainer will tell you that a real clambake needs wood for the fire . . . so why is there a foot sticking out of the oven? The townspeople want to pin the murder of the RV park owner on Cabe Stone, a new employee of the Snowden Family Clambake Company�who bolted from the crime scene and disappeared. Julia knows having another murder associated with her family�s business is a recipe for disaster . . . but who is the killer? Cooking up a proper investigation doesn�t leave much time for the rest of Julia�s life, and this is one killer who�ll do anything to stop her from digging up clues . .
At the Claminator, Sonny conferred with Cabe, his expression serious. As the band hammered its way to a big finish with the �The Stars and Stripes Forever,� Bunnie climbed the single step to the stage and stood behind the podium. I scanned the crowd for Stevie, but didn�t see him. Evidently, Bunnie was done waiting. From my perch on the curb, I glanced over at the Claminator. Sonny and Cabe�s conversation grew more intense. Even from thirty feet away, I could tell Sonny was unhappy about the fire. Livvie scooted over to speak to him, then walked away, looking concerned. Sonny lifted the mesh skirting of the Claminator and aimed the hose he�d been using to spray the canvas at the fire to dampen it. He jumped back as the flames surged outward, like a grease fire. But there was no grease in a clambake meal that could drip into the fire. I�d worked at the clambake for years and never seen anything like it. But then we�d never cooked on the pier before. This was the maiden voyage of the Claminator. Sonny said something urgently to Cabe, who jogged toward the fire truck parked on the street beside pier. Sonny bent down and lifted the metal skirting again, a poker in hand. The crowd surged around him, blocking my view. Sonny swore loudly. The crowd parted just in time for me to see something that looked like a charred human foot and part of a leg fall out of the fire onto the pier.